"This is most peculiar," a young Jane Porter (Margot Robbie) remarks when, lost exploring the wilds of the African Congo with her scientist father, she encounters an equally young Tarzan (Alexander Skarsgard). Certainly, what are the odds a beautiful blonde, blue-eyed American woman would meet the love of her life, a beautiful blonde, blue eyed British Lord raised by gorillas in the jungles of Africa? (Although Jane was specifically referring to Tarzan dropping to all fours and sniffing her crotch. Tarzan's got game with the ladies.) Years later, Tarzan and Jane are happily married, living in his ancestral castle in England as Lord and Lady Greystoke. Tarzan, you see, was born John Clayton III, Earl of Greystoke, but he was stranded in the Congo as an infant when his parents were killed. Baby John was adopted by a gorilla named Kala and raised among the apes. He gained mastery over the animals and was given the name Tarzan (not by the apes, obviously). Tarzan and Jane is quite a story, one that would be the basis of pulp tales that would enthrall the 19th century world ("Him Tarzan, you Jane" is quoted right back to their faces). Civilized, Lord Greystoke is quiet and thoughtful, the wildness in him subdued. But international politics and the machinations of Christoph Waltz, would lure Tarzan back to the jungle. Waltz, an envoy of King Leopold II of Belgium, schemes to save the bankrupt Belgium government by extracting the diamonds of the Congo, which are controlled by tribal leader Djimon Hounsou. Hounsou will give Waltz the diamonds if he delivers his arch enemy, Tarzan. Tarzan killed Hounsou's son, you see, because Hounsou's son killed Tarzan's mother. Not his human mother, his ape mother. Jungle life is sordid and complicated. Nonetheless, Tarzan and Jane, with Samuel L. Jackson, an American envoy investigating the rumored shady dealings of the Belgian government in the Congo, march right into a trap set by Waltz. Tarzan is easily captured and hogtied; Jackson manages to rescue him while Waltz flees with a kidnapped Jane. Thus begins a merry chase through the jungle as Tarzan tries to save Jane, trapped aboard Waltz's steam ship. Waltz would soon come to regret trying to hold Jane hostage, however. She's cunning, brave, and has wildness in her to match her husband. Speaking of wildness, Bane in The Dark Knight Rises would remark that civilization has defeated Tarzan, and he'd have a point. As Tarzan sheds his clothing (keeping his torn khakis on rather than donning the traditional loincloth), he must Tarzan-up and re-embrace his full Tarzanity. For most of the movie, Tarzan has a rough time of it. He loses a wrestling match with a gorilla and readjusting to savage jungle life is more difficult than he anticipated. (Jackson managing to keep pace with Tarzan in the jungle without being killed requires the most suspension of disbelief, in a movie that is essentially all about suspension of disbelief.) Still, Tarzan becomes wilder and wilder the closer he gets to Jane, and soon, he fully embraces his status as being Lord of the Jungle, master of all CGI animals, able to command legions of computer generated beasts to do his bidding. Much like he did in the last four Harry Potter films he helmed, director David Yates bleeds much of the color from the jungle, and his CGI animals reek of pixels. Skarsgard makes for a physical, visceral Tarzan, and the camera simply loves Robbie. 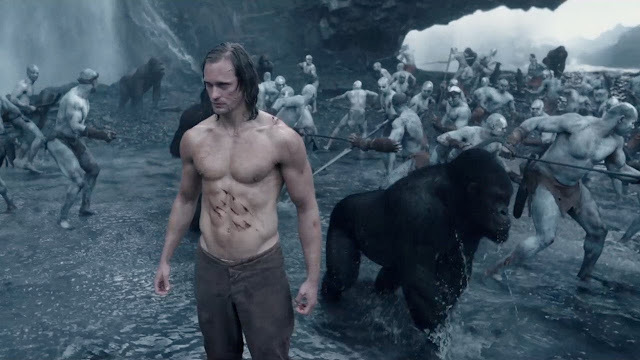 The Legend of Tarzan is replete with thrilling jungle fights, but the touching moments mostly involve Tarzan rubbing his head against people and beasts he loves, like a pride of lions he'd known since they were cubs, or Robbie herself. Amusingly, The Legend of Tarzan's take on 19th century European politics curiously reflects modern day, as England realizes the duplicity stemming from Brussels and decides to #Brexit from their joint affairs in the Congo. As coincidences go, that's pretty wild.